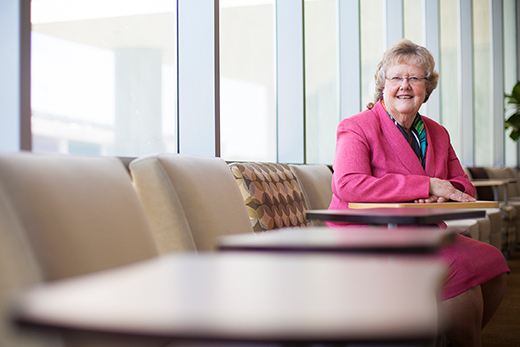 When Nancy Thompson 71C 77MPH was called recently to the president’s office — to receive congratulations on winning this year’s Scholar/Teacher Award — she confided to a fellow Emory College alumna that she wasn’t sure where the president’s office was, despite nearly 40 years of service to Emory. It has been quite a road from undergraduate math whiz and social justice advocate to a place on the Commencement stage receiving one of the University’s top honors. For her decades of path-breaking work, Thompson is the 2016 recipient of the Scholar/Teacher Award, supported by the United Methodist Church's General Board of Higher Education and Ministry. A Florida native, Thompson planned to go to Florida State; however, her impressive SAT scores convinced her guidance counselor that she should consider Emory. When Thompson came for a visit, she was still undecided, but her parents — upon learning she had been offered a scholarship on the spot by the admission dean — voted for Emory. Thompson was one of 200 women students admitted to an Emory class of 600. There was a ceiling on the number of women who could be admitted and, says Thompson, the women generally had to have SAT scores 200 points higher than the men to be accepted. At the end of her junior year, Thompson needed to stay in town for the summer because she was president of the Resident Women’s Association at Emory and would need to welcome the new class. She resolved to walk to the Centers for Disease Control and Prevention (CDC) and, if necessary, to the Veterans Administration to find a job. It took only the short walk to the CDC. Following graduation, she continued working for the CDC, thereby becoming one of the many people to “get into public health by accident.” She became a statistician, doing everything from randomizing vials to collecting data on lab licensing across states. The CDC agreed to pay for her master’s degree. Thompson joined the first-ever Emory class of master’s students in community health in 1975, a program offered through the School of Medicine. After graduating, she reapplied for her job at the CDC and was given a new title — epidemiologist. For Thompson, epidemiology was a tool; psychology was her real love. The CDC tried to slot her into administrative roles, saying that her lack of a doctorate or MD dictated that path. She soon remedied that by enrolling in the doctoral program in psychology at Georgia State University. The CDC declined to finance this phase of her education, declaring: “There is no room for someone with mental health training in public health.” Oddly enough, this was at the dawn of the AIDS era and when the cognitive effects of Agent Orange were first becoming known, both of which argued for the full participation of mental health experts. Thompson meanwhile, with energy abounding, had been teaching at Emory since 1978 in addition to her employment at the CDC. A number of her MPH classmates had been out of school long enough to be rusty in aspects of math. Thompson taught tutorials and in the process discovered that she was sought after as a teacher. In some ways, it was not unexpected. Her mother, who had a physiology background, matter-of-factly taught her daughter about the birds and bees when Thompson was 10. Thompson turned right around and taught her friends. The MPH at Emory was created in 1983. During that year, Thompson worked at the CDC by day and taught the program’s lower-level courses at night. Two years later, Thompson cut ties to the CDC and came to Emory full-time. Forces were coalescing for a school of public health at Emory, and Thompson was in the thick of it. The Rollins School of Public Health was founded in 1990 and accredited two years later. Colleen McBride — Grace Crum Rollins Professor and chair of Behavioral Sciences and Health — describes Thompson as a “founding mother and curricular visionary in the School of Public Health.” Currently, a revisiting of the curriculum is in the offing. Thompson teaches without ego. To her, “It is more important what my students know versus what I know.” That fact is not lost on her many grateful students. "She could teach a rock"
So, Foster combined a piece of granite with a plaque on which he inscribed the words of that alumnus. The rock sits on her desk at home, but a photo of it accompanies her everywhere. Thompson’s scholarship has won acclaim equal to her teaching. She confesses to always having had an interest in what she calls “underdog” research projects. Considered one of the five most influential behavioral scientists in the field of epilepsy, Thompson recently spearheaded Project UPLIFT, designed to reduce or eliminate depression in epilepsy patients based on mindfulness and cognitive therapy. The program — offered through the Epilepsy Foundation, among others — has achieved significant impact; and Thompson designed it to be extensible, with funding coming recently from the Cystic Fibrosis Foundation. As a scholar, Thompson’s expertise ranges from asthma to organ donation to end-of-life care and beyond. She has produced more than 80 peer-reviewed articles, 10 book chapters, and a coauthored book titled “Demonstrating Your Program’s Worth: A Primer on Evaluation for Programs to Prevent Unintentional Injury.” It won a CDC Communications Roundtable Award. Thompson will step down from Emory in 2019 but remain involved with Project UPLIFT through 2021. Fear not for how she will fill her days. Like every plan Thompson has formulated, it is ambitious. She will delight in, and care for, her four grandchildren. She will write scholarly papers that have been deferred by a hectic schedule. She will play more. Thompson also talked about hoofing it from her house to Whitefoord Elementary and offering her skills teaching mindfulness. She laughed, wondering how often itinerant teachers walk through the doors of elementary schools. Would she be accepted? As in so many other instances where she was laying new ground, Thompson is going to give it a shot.